Many of us dream of turning traveling into a career. Seeing new cities, new people, beautiful landscapes, it’s practically a dream come true if you can get paid to do it. Unfortunately, very few career choices make traveling an option or even part of the job. Today, truck drivers are like modern cowboys of the American West. Instead of driving cattle across the mountains, they’re driving semi trucks all over the United States. Bands like Grateful Dead and Alabama have romanticized the trucking life, but is it a sufficient way to get paid to travel? Many truckers certainly think so. Ross Ufberg, a journalist for The Guardian, spent five days on the road with a truck driver, Ron Bartoli. 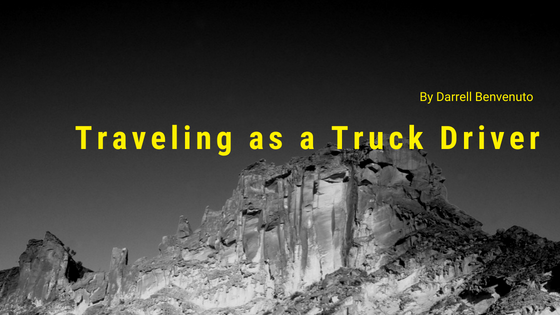 During that trip between Pennsylvania and California, Ross learned that while trucking is undoubtedly not for everyone, it is a good life for those who are called to it. Unless you decide to drive locally, it is mainly a solitary life. If you long-haul, you can be on the road for weeks or even months at a time. You drive for long hours, most times going for eleven-hour stints with three hours for fueling up, eating, and sleeping at rest stops. Some drivers like to haul in pairs so they can tag-team the routes. Others prefer to drive alone. While the long hours and longer stints on the road are the downsides, many drivers love the open way. How many of us wish we could just hit the open road and not look back for the next hundred or so miles? That’s why many truck drivers stay in the business. They love the freedom of driving the open road, traveling across state lines, and seeing the scenery. It’s a job where they get paid to see the country. There are not many jobs that can afford them that luxury. Truck drivers agree, for all the unsociable hours and long months away from home, what they do is probably one of the best jobs around. There are not many careers where you get paid to travel without the prerequisites for a college degree. All you need is a license and a love for the open road. Previous PostThe Trucking Industry Goes Green? Millennials Are the New…Truck Drivers?